The anti-gun crowd is really going to hate this. The FBI is really hard to argue with whenever they release information at the middle levels. A report was just released saying that out of the 50 active shooter incidents for the study, four of them were stopped by a good guy with a gun. Of course the first thing you'll notice is that the number 50 is much lower than the number spewed by our opponents. Another thing that you'll notice is that there were four people who used their firearm to stop the shooter (eight citizens total, four used firearms to stop the threat). While that seems like it's a big discord, keep in mind that it's hard to know for sure how many lives those gun carriers saved. It could be dozens each time or just a few. Either way, those folks are heroes. 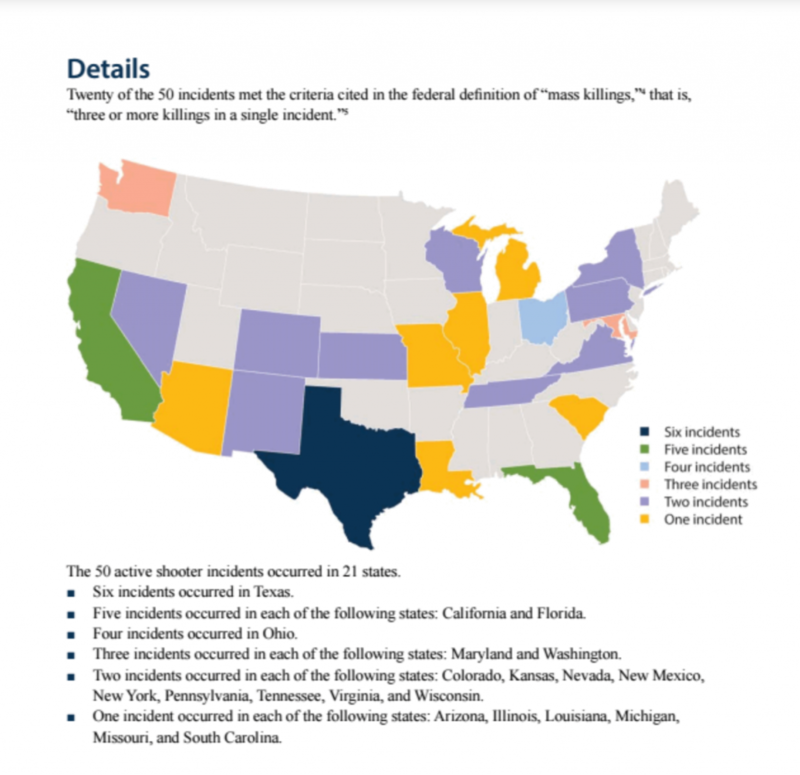 Also try to keep in mind that California, New York, and Maryland account for nine of those 50 active shooter scenarios, and it's very hard to carry a gun in each of those states. The conclusion that I'm drawing here, is that the number of times someone could have used a firearm in defense of themselves or others drops by nearly 10 instances because of the state government's inability to follow the Constitution of this great land. I believe beyond doubt that the number of good guys with a gun stopping bad guys with a gun would surely be higher if people were allowed to carry guns in those states. Remember, good guys are the only ones following the gun laws. The bad guys are not following them, which is why shooting situations even happen in those states to begin with. Let us know your feelings on this in the comments below. And, as always, stay safe and carry a gun because you never know when you'll need it. Would really like a link to the report. Hey Paul, the link is in the beginning of the article. Highlighted in blue. Two incidents in Tennessee, and both were stopped by citizens. The Burnet Chapel shooter was stopped by a citizen with a handgun, the Waffle House shooting was stopped by a citizen who grabbed the perpetrator’s gun. How’s about them apples! Yeah try to grab a gun from someone who knows how to shoot. Say hello to my grandpa for me please. You say stay safe and carry a gun. Are you suggesting I break the law? Surely I would rather be judged by twelve than carried by six. I live in California. If I were assured Police knew the difference between a good guy and a bad guy with a gun and not have to fear repercussions, sure. When will the Cops stop shooting and killing the good guys with guns that are stopping a mass shooter or helping people escape from one? Situations, where police shoot the wrong person, are tragic no doubt and ideally, this should happen in 0% of the cases. But the instances where police confuse the good guy for the bad guy are incredibly small. I can think of two recent stories and in both instances, the good guy’s actions made it very difficult to distinguish who was the actual threat. Law enforcement’s response is only one side of the equation. Concealed carriers who decide to intervene in a chaotic scene, need to make sure they act smartly. Training in these areas is lacking in many concealed carry classes or other handgun classes. The recent Thanksgiving night shooting at the Galleria Mall is likely foremost in people’s mind. There is still not enough information to definitively say the police just shot the first person who they saw with a gun. If you can send me some links to instances where police arrived and shot the good guy for no reason, I would be happy to look them over. The state of NJ has deemed that even qualified law enforcement officers under LEOSA are not recognized and could be arrested for carrying concealed even after fulfilling all qualifications and obtaining credentials from your agency. How many times could they possibly step on your 2nd amendment rights and get away with it? When will the state of NJ be put in its place by the courts or the federal government?. By designating 50 incidents in 21 states as “active shooter,” there is little doubt this is a minuscule sampling of all the illegal shootings, robberies, muggings, attempted abductions, et al in the U.S., which would be much more useful in determining the role of the legally armed citizen. This document tells us virtually nothing useful in that regard, in that many “active shooter” locations have been in ‘No Carry Zones;’ schools, churches, post offices, and the like, which are a no-go for the armed citizen. I think ConcealedCarry dot com is trying to make a silk purse out of a snapshot with a narrow sight picture. Apologies for the (very) mixed metaphors. Jack agreed that Active shooter events represent a small percentage of all violent crime. 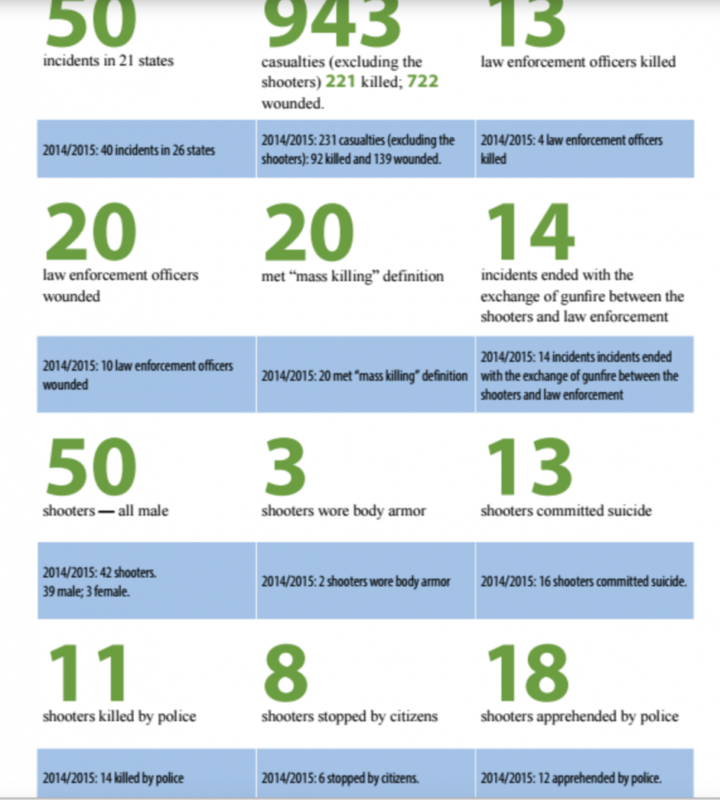 That said we are looking at almost 300 incidents in all 50 states in this study. We are including every incident that meets the FBI definition of Active Shooter. Not sure where you got the 50 incidents in 21 states numbers. I’m also confident that if we had all the data for all incidents the numbers would still hold true. The recent release by the CDC of the study that suggests guns are used in self-defense more often then they are used in crimes is an example of other research being done that tells the same story. The qualifications to get a CCW license is the basic fire arms training. One needs to be trained with advanced classes to be effective in a live fire active shooter scenario. Or be prior military trained for combat. In advanced training instructors teach shooting multiple targets differentiations by calling out specific targets Moving and multiple positions. Defining cover and concealment, developing skills, knowledge, and the correct mindset(attitude) to survive and know what’s around you and coming up from behind you. Like the police. Josh, keep up the good work! 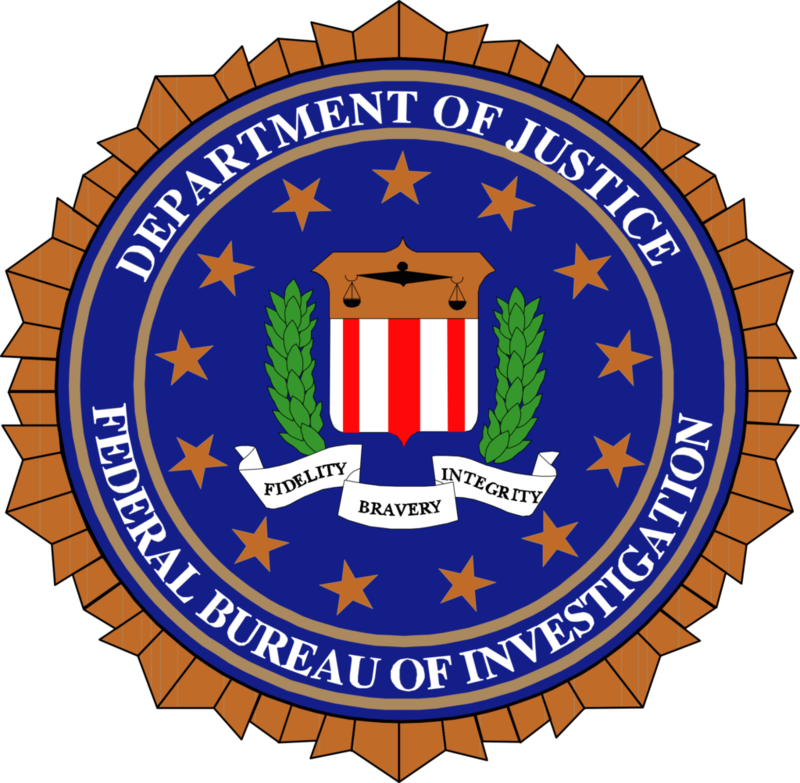 When do you kool aid drinking, trump followers believe the fbi only when you see it benefits your idiotic beliefs. Lol education first. I’m always impressed when people get on a sight that attempts to speak the truth, and the first thing they do is start calling people names and being sarcastic. Not sure where you get your education but, most all crime information in this country is collected by the CDC and the FBI. Show us your info so that we can be educated. Chad from your post you seem like anti gun well let me ask you this, if an active shooter comes into a restaurant where you and your family or close friends are enjoying your meal and company and the shooter starts popping in your direction the guy at the table next to you falls, then another guy gets up and puts two in the shooters chest would you thank that person or would you start screaming why do you have a gun and protecting me and my family ? The second question I have for you, do you really think gun control and gun free zones will stop the criminals that use a gun in a crime? Do you really think criminals obey the gun laws? Gillem’s headline is a cherry-pick.